Campbell University Norman Adrian Wiggins School of Law is the first university program in the United States to obtain a conference bike, which seats seven and lets groups conduct meetings as they cycle around town. Rich Leonard got a fair share of weird looks from passersby as he cycled around Raleigh, North Carolina, on Wednesday. That’s probably because the dean of the Campbell University Norman Adrian Wiggins School of Law wasn’t riding solo—he had six other law school staffers onboard the school’s new conference bike. Yes, you read that right: Conference bike. 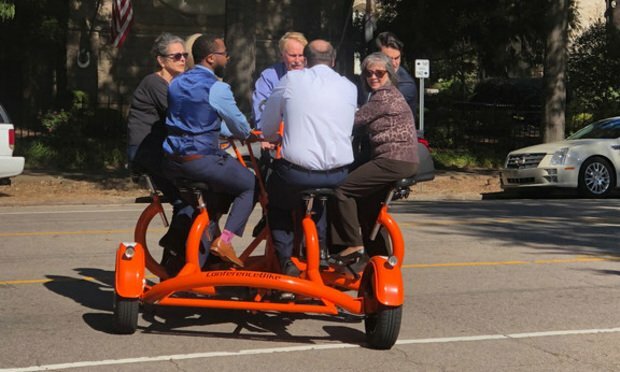 Campbell Law looks to be the first university program in the United States to obtain a so-called conference bike, which is pretty much what it sounds like: a moving contraption that seats seven people on which you can conduct meetings while peddling around town. Leonard understands if that sounds a little crazy, but bear with him. “The idea is—especially in North Carolina where our climate is temperate most of the year—if you are some of my staff, or a subcommittee, if you’re a student leadership group, if you’re a faculty member with your advisees and you want to talk about something and get some exercise and fresh air while you do it, you can get on the bike and tool around town,” Leonard said Wednesday after taking the conference bike out for its maiden voyage. Leonard got the idea last spring after seeing a conference bike in Vienna, where he was attending an arbitration moot court competition with students. He immediately began investigating what it would take to get one for the law school. Campbell already has some experience on the bike front. Leonard started a bike share program three years ago, where students can check out one of four loaner bikes that are kept in the school’s lobby. Students often use the bikes to zip over to externships at law firms and courts, Leonard said. But the conference bike goes a big step further. It’s made in Holland, and it took five months to get, in part because Leonard insisted it be made in the university’s bright orange color. (This required the metal to be specially dyed.) Leonard declined to disclose how much the school paid for the bike, but said it was lower than the $12,750 listed on the manufacturer’s website. He said the makers are eager to enter the U.S. market, beyond the California campuses of Google and Facebook, where they are already in use. So what do students make of the conference bike? People have certainly noticed the bike around Raleigh. The school has only had it for a week, but is already fielding questions from other community groups about whether it will loan or rent the conference bike out. The school plans to keep it close, due to liability concerns, Leonard said. While the first ride was deemed a success, the inaugural crew learned a few lessons. Namely, that the bike is heavy. About 1,000 pounds heavy.